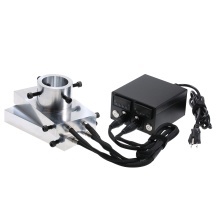 This electric double PID temperature control box with heating rod for rosin press plate is compact and solid. With 2 heating rods, 1 piece of double PID controller, dual heaters, dual temp sensors. Fast heating and time setting available, LCD Digital controller shows clearly. With 2 heating rods, 1 piece of double PID controller, dual heaters, dual temp sensors. Wide temperature range of 0~1300℃. Electric enail temperature control box with heating rod. Double hole enail heating plate, suitable for double sides print/press. Thick heating plates make sure high pressure for work. Heat plates are made by aluminium, light but heavy duty use heating. Fast heating and time setting available, LCD Digital controller shows clearly.